The Islamic State’s Amaq News Agency released a short video purportedly showing this fighter firing a SPG-9 at the airport in Kabul earlier today. Both the Taliban and the Islamic State’s Khorasan “province” claimed responsibility for an attack at the airport in Kabul, Afghanistan this morning. The rocket assault coincided with a visit by Secretary of Defense James Mattis to the country. However, according to press reports, Mattis was not at the airport at the time. 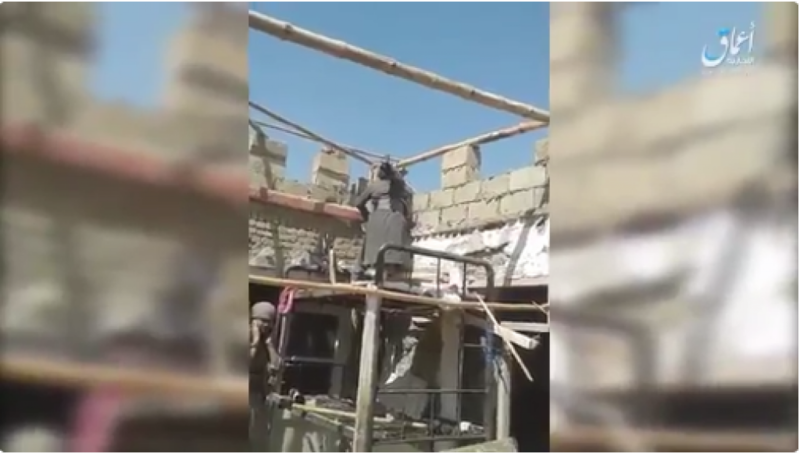 The Islamic State’s Wilayah Khorasan (or Khorasan “province”) released a short video purportedly showing one of its fighters firing an SPG-9 at the Kabul airport. In a longer statement, the terrorist organization also claimed that the rocket launches were part of a broader operation in Kabul that included inghimasi fighters armed with suicide explosive vests. Inghimasi operatives are generally well-trained, but are willing to blow themselves up after engaging in firefights. 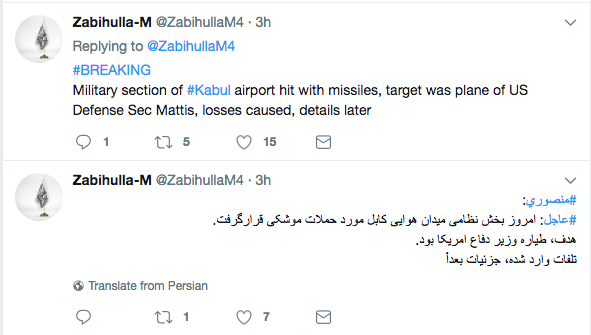 In a Facebook post, the Taliban reiterated that Mattis was the target of the rocket strikes, adding that more details would be forthcoming. According to TOLOnews, the assault on the airport lasted more than five hours. It is not clear how many people were killed or wounded. Both the Taliban and the Islamic State operate in the Afghan capital, which is still not secure 16 years into the Afghan war. Each organization is capable of carrying out large-scale terrorist attacks inside the city, including suicide bombings and complex raids. In July, the United Nations Assistance Mission in Afghanistan (UNAMA) released its midyear report on civilian casualties. 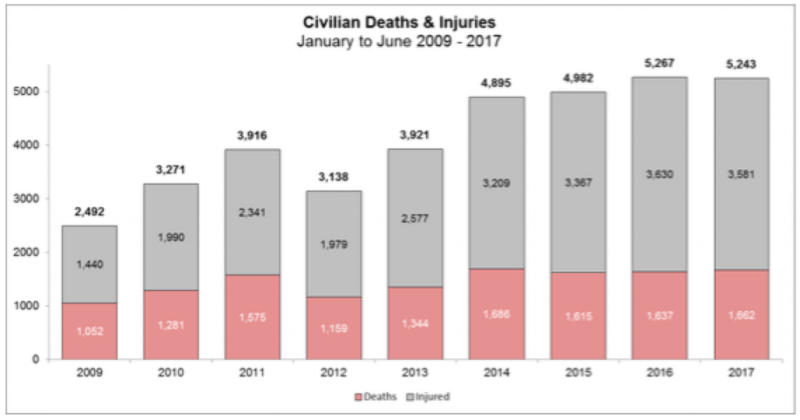 Between Jan. 1 and June 30, 2017, UNAMA “documented 5,243 civilian casualties (1,662 deaths and 3,581 injured)” throughout all of Afghanistan — the second highest total since UNAMA began tracking this figure in 2009. Only 2016 witnessed a greater number of civilian casualties during the same timeframe, but even then the figure was on par with UNAMA’s estimate for 2017. Nearly 20 percent of these civilian casualties — 1,048 (“219 deaths and 829 injured”) — occurred in Kabul province and “mainly” within the city of Kabul itself. Kabul province witnessed a higher number of civilian casualties than any other province. This was due to a series of bombings and other operations carried out by Wilayah Khorasan and the Taliban. The overwhelming majority of civilian casualties in the Afghan capital during the first six months of 2017 were caused by what UNAMA describes as “suicide and complex” attacks. Indeed, civilian casualties from these types of operations rose by 15 percent in Afghanistan during the first six months of 2017, as compared to the same period last year. “Suicide and complex” attacks are now the leading cause of civilian casualties, according to UNAMA, and have hit Kabul city especially hard. And of course everybody lies. Anyone hear that the attack began before Mattis’ visit? If true, sounds like a mole.